If you’re lying in bed at 6am with a mild hangover (we blame our friends who came to stay) you can do without your cats making unusual noises outside the bedroom. Not a request for food or a desire to use the litter tray, but a tapping sound interspersed with scampering paws. In darkness we stumbled out of bed, bleary-eyed, to encounter a scolopendra being harassed in the corridor. It moved so quickly that its legs were a blur, temporarily fooling us it was a baby snake. It moved like one too. © United Artists Corp. and Danjaq, LLC. 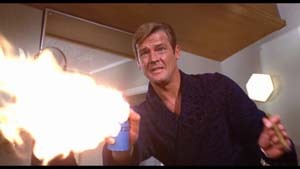 There’s a scene in Live and Let Die where James Bond (Roger Moore) spots a snake in a mirror and turns his deodorant spray – lit with his cigar – into a mini flame thrower, frazzling it. So, in a gentle panic and sending various items flying from the bathroom cupboard, M grabbed some shaving foam and squirted it over the scolopendra. Dusting it with foot powder or dropping an ankle support bandage on it just didn’t seem the right choice (perhaps Gillette could include this use in their next advertising campaign). 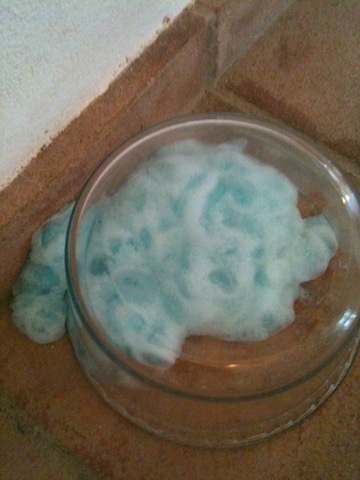 The poor thing is entombed in a blue blob the size of a pre-oven soufflé. It looks like ectoplasm. We wonder whether, like cockroaches which can survive a nuclear war, it’s still alive. And what happens if there’s a whole army of them in the house? Yikes. We aren’t celebrating its death – we really didn’t want to kill the thing but the cats were at risk, constantly sniffing and tapping it (they can injure and even kill small animals). And frankly, standing naked in the corridor with guests next door just wasn’t on. We’ve encountered at least two before and they’re ugly things. We’re unsure if the cats knew it was dangerous, it certainly doesn’t hide the fact having black and yellow stripes. Tonight we’ll be checking under the bed. I once threw a milk carton at a spider. The shaving foam idea is one I shall keep in mind!